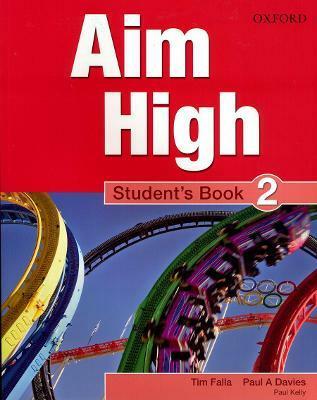 Aim High will help your students succeed as language learners in the classroom, with their homework and also, in exams. How will it do this? It builds students' vocabulary knowledge through a structured and progressive approach. What does this mean? There are over 50 active vocabulary items in each unit, including words from the Oxford 3000TM. Students learn the meaning of new words but they also learn how and when to use them for themselves. And these are not just useful, everyday words. They're also introduced to expressions, idioms, phrasal verbs, and so on. Essential language for communicating well in English. As a teacher you'll want to help your students become autonomous learners. In Aim High there are lots of opportunities to prepare for this. In the Student's Book there's a 'Dictionary Corner', with exercises to help them towards learner autonomy. With the self-check and review boxes they can see how they're progressing for themselves. A Grammar Reference and Grammar Builder bring together all the grammar and vocabulary for the unit. These allow students to look back over grammar points and review what they have learned.